Francis Antony Marlow (known as Frank) decides he wants to be a detective on leaving school. 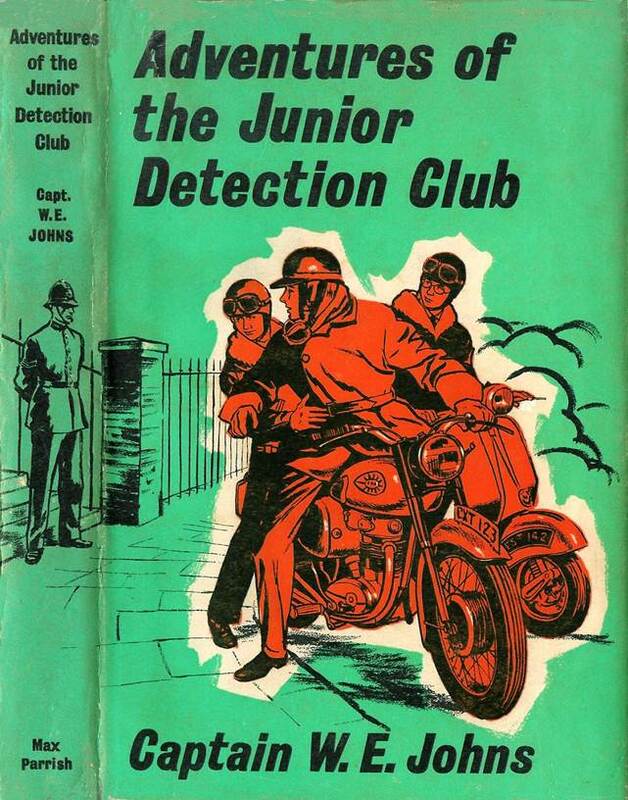 Two friends, Alexander Forsyth (nicknamed "Sandy") and David Morgan (nicknamed "Stoker") team up and join him and together they put up some money and set up in business as "The Junior Detection Club". The plan is to make money by solving crimes and collecting the reward money where offered. Frank is friendly with an ex-Detective Inspector by the name of Jack Gripper and Frank has been collecting pictures of known criminals from various sources in an effort to memorise their faces. The three lads spend some time getting to know the West End of London and the various side streets of Soho where criminals hang out. One day, Frank recognises a man as Larry Larkin and realises that he has escaped from Dartmoor prison. Frank tips off the police who arrest Larkin. Following up a lead, the boys go to watch a youth called Charlie Morton who is being released from Borstal. The boys suspect that old cronies may try to drag Charlie back into crime. Two men meet Charlie on his release and Frank and Stoker follow them on Stoker's motor bike. Charlie is taken to a cafe and when he is finally left alone, Frank goes to talk to him. Charlie is willing to tip them off about a job he is being roped into involving a burglary in Knightsbridge. Returning to their base, our heroes are visited by Detective Superintendent Vowden from Scotland Yard who wants to find out what the boys are doing. Staking out the scene of the proposed burglary, our heroes see two villains, called Blacky and Zamboni carry out the burglary. They follow them to a junk shop and tip off the police. The villains are caught red-handed and a hoard of valuable jewels is recovered. For this, the boys received £200 from the Insurance Company. Charlie is paid a share of the reward money and Frank asks him to refer other boys who are trying to keep out of trouble to them. Shortly afterwards Charlie contacts them with a friend called Bert Chandler. Bert drives a lorry for a living and is being forced to take part in a hi-jacking of his own lorry when it is laden with whiskey. Bert is able to tell Frank, Stoker and Sandy where the hi-jacked lorry will be hidden and when the crime takes place, Frank, after making sure the lorry is there, is able to take Superintendent Vowden straight to it. The lorry hi-jackers are caught and the boys get £100 reward. One day, when filling up with petrol at a garage, Frank recognises a villain driving a red Jaguar, known as Johnny the Gent. Our heroes follow him and discover that he is taking an Italian girl out for lunch. She works for Sir Otto Gronheim, a multi-millionaire who lives at Mapleton House. Johnny the Gent is a jewel thief and our heroes suspect he is going to pull a job when Sir Otto has a party by using his girlfriend to let him into the house. On the day of the party, the boys lay in wait and see Johnny go into the house. Johnny is seen by the butler, a man called Judkins (a name that Johns is very fond of using for butlers!) who chases him. Judkins is hit and Frank is shot at when he goes to the butler's assistance. However, knowing where Johnny lives, our heroes are able to advise the police and they soon catch him and various items of stolen jewellery are returned to their rightful owners. A grateful Sir Otto, and his guests, give the boys £200 for their trouble. When Charlie has a birthday, the boys take him out to the Chez Picot club and here they meet a friend of Charlie's called Nibs Shaw. A well-known criminal called Paddy Mulvaney is taking a more than willing Nibs on a job. Working out what the job is going to be by good detective work, the police are tipped off. Paddy Mulvaney has a habit of carrying with him Nitro-glycerine for blowing safes and when he jumps off a roof to escape the police, the notoriously unstable liquid explodes and kills him. Nibs is badly injured in the explosion as well. Continuing their regular survey of London, Frank recognises a con man called Maurice De Vere Brooke. He sees him sell an item to a rich business man and Frank gets a quick glance at the item. Making enquiries, the boys are able to find out who the business man is and are also able to identity the stolen piece of jewellery. It is known as the Empress Ikon from the Wallace Collection. When the business man, who goes by the name of Count Stablinsky, tries to leave the country with the stolen Ikon, customs are able to find it, having been tipped off by the police. For the boys' next assignment, Frank suggests they try to find three old masterpieces painted by famous painters and stolen from Babton Abbey three years before. By advertising in various newspapers to buy old paintings, they find the wife of the person who stole them and also discover that the original thief was killed in a traffic accident the day after the theft. This time, the reward money for the return of the paintings is £2000. The business has been so successful, it is now time for the three boys to have a holiday and take a well earned break.